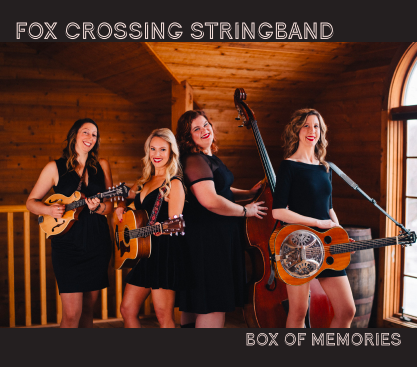 Fox Crossing Stringband, four women from Chicago that know their brand and don’t shy away from it. They have that charming blend of sweet and strong that draws you in but demands respect. This all-female bluegrass group from Chicago has been winning hearts with their beautiful harmonies, original songwriting, and entertaining stage presence ever since forming in November 2016. Following their debut performance at Winter Roots Festival in February 2017, they’ve gone on to perform at many festivals and events across the Midwest. Traveling east to the John Hartford Memorial Festival, west to Dawn and On Festival in the Quad Cities, north to Door County, and everything in-between. Performing events such as IBMA award-winning Frankfort Bluegrass Festival, Summer Stomp, Shoefest, East Troy Bluegrass Festival, Ladies of Bluegrass Festival, The Illinois State Fair, American Music Festival, and more. They have performed on the WGN Roe Conn Radio show, as well as at venues such as the Source in Manawa, Fitzgerald's in Berwyn, Schubas, Martyrs, and as part of events put on by City Winery and Navy Pier in Chicago. With their debut album scheduled for a February release, these Foxes are on the run and coming to a town near you! 4 bands for one $10 Ticket!